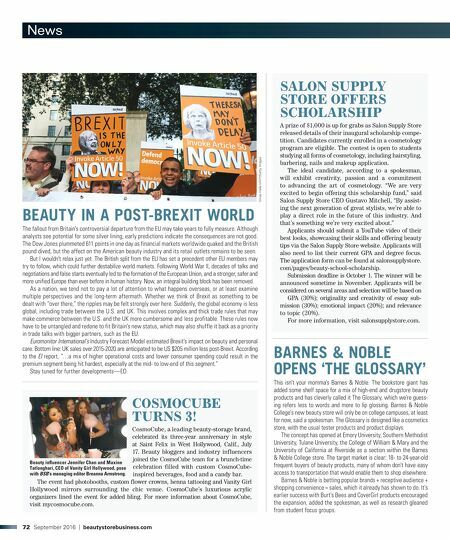 beautystorebusiness.com | September 2016 73 INSTANATURAL LAUNCHES 'NATURE-INSPIRED' SOLUTIONS Natural skincare products topped at an estimated $36 billion at the manufac- turers' level and experienced more than five consecutive years of double-digit growth, according to Kline. This is good news for InstaNatural. The skincare maker has newly revamped products that contain "even more effective ingredients," according to a spokesman, and are wrapped in "new, modern-look packaging." The new line is made from a proprietary blend of botanical ingredients the company claims are "more potent, safe and effective." The brand will roll out the new products to its distribution channels over the next few months beginning with: InstaNatural Vitamin C Cleanser ($21.97); InstaNatural Vitamin C Serum ($17.95); InstaNatural Vitamin C Moisturizer ($19.97); InstaNatural Glycolic Cleanser ($19.97); InstaNatural Moroccan Rose Water ($13.97); and InstaNatural Fractioned Coconut Oil ($13.95). "We've recognized through our research, a consumer appetite for safer beauty and skincare solutions," said Ethelbert Williams, chief marketing officer. "We also clearly understand that the category consumer should not have to compromise efficacy or the ability to find the right product for [his or] her skin. This comes with a renewed brand design and further upcoming product innovation." As part of the relaunch, InstaNatural plans expansion into new retail channels, according to Williams. FAROUK SYSTEMS HAS NEW CEO Rami Shami has been appointed CEO of Farouk Systems, Inc. by his father, Dr. Farouk Shami. According to a spokesman for the company, Rami has been tasked to fine-tune the operations and production of the CHI and BioSilk brands. He is also responsible for the expansion and opening of mul- tiple manufacturing sites for the company, such as the Farouk plant. "His business sense," added the spokesman, "has stream-lined and improved every avenue of manufacturing, all while cutting company costs and keeping inventory at premium levels." In addition to operating the manufacturing and production of CHI and BioSilk, Rami plans shows and educational events across the Middle East, as well as in the U.S. His understanding of the industry has provided educational tactics aimed to groom hairdressers into becoming their own success story, according to the spokesman. Rami will continue to oversee the operations and production pro- cesses while seeking to improve all aspects of the company and its departments with his executive team. Goals include expanding the bottling/manufacturing plant and overseeing the upcoming launch of the Esquire Men's Grooming Line in October. Plans also include the expansion of CHI Partner Schools, as well as growing international distribution growth. Visit farouk.com Image courtesy of Farouk Systems BEAUTIFUL, IDENTIFIED While we generally believe the old adage that beauty is in the eye of the beholder, at least one university study would disagree. Certainly, poets and philosophers have been trying to define beauty (and love, of course) for centuries. Looks and trends, colors, textures and styles come and go, but perhaps there is a "beauty baseline" that may help you serve your customers. A University of Toronto and UC San Diego study took a hard look at what we typically perceived as a beautiful face. It's a matter of geometry, according to the 2011 report, or more to the point, symmetry. The study reportedly applied the "golden ratio," a geometric proportion used in art, architecture and design. Apparently, it can also be used to design faces. The ratio is supposedly found in nature, where shapes are repeated in the same proportion. The idea is not without strong debate and has been labeled a myth, or at least an inaccurate exaggera- tion. Regardless, the study indicated there is a balance and symmetry we find aesthetically pleasing, although there are nuanced variables and influences that run along cultural and ethnic lines. The study measured the distance from the hairline to the eyebrows, the distance from the Cupid's bow to the tip of the mouth, and the width of the nose compared to the width of each side of the face. Plugging the data into the golden ratio, they discovered proportions between facial features that are generally considered "beautiful." Pam Pallett, a co-author of the study, says, "The point of this study wasn't to find what makes you beautiful, it's to understand why." In other words, there remains no concrete definition of beauty, only what we perceive as beautiful. This is influenced by, according to Pallett, the cumulative averages of all the faces we see over a lifetime that we perceive as attractive. Our sense of what's attractive is also influenced by our environment, ethnicity and cultural exposure. "If you're growing up seeing Chinese faces, you might have a preference for an average Chinese length and width ratio rather than a white person's length and width ratio," adds Pallett. The lesson here is the mathematics of symmetry is subconsciously working in our brains to instantly decide what's hot and what's not, but other factors are also at work. When it comes to helping your customer maximize their natural beauty, be aware that cultural and ethnic differences factor into the equation. Some may want a more contoured nose or cheekbone, while others may not. There is a whole primal psychology to attractiveness that includes posture, confidence, energy, intelligence, mating age, and so on, but it all starts with the face. HALAL COSMETICS TREND GLOBALLY Beyond eco-friendly, vegan or organic, the latest trend in the beauty industry is halal products, which means it is permissible for Muslims to use under Islamic Shariah (law). According to recent international reports, it has been predicted the halal beauty market is projected to grow more than 15% in the next five years. 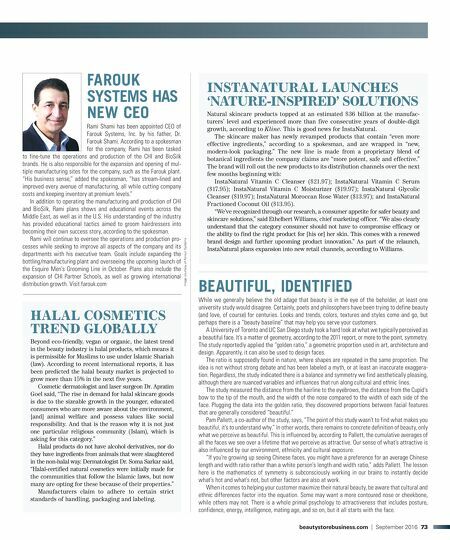 Cosmetic dermatologist and laser surgeon Dr. Apratim Goel said, "The rise in demand for halal skincare goods is due to the sizeable growth in the younger, educated consumers who are more aware about the environment, [and] animal welfare and possess values like social responsibility. And that is the reason why it is not just one particular religious community (Islam), which is asking for this category." Halal products do not have alcohol derivatives, nor do they have ingredients from animals that were slaughtered in the non-halal way. Dermatologist Dr. Soma Sarkar said, "Halal-certified natural cosmetics were initially made for the communities that follow the Islamic laws, but now many are opting for these because of their properties." Manufacturers claim to adhere to certain strict standards of handling, packaging and labeling.